People are randomly split into two (or more) groups. These groups are your sample. It’s known as a sample because it isn’t every customer who ever purchased from you. It is a sample of those customers. You need enough customers to make sure you have a statistically significant sample. This provides a high likelihood that the behavior you’re recording from this sample accurately represents customer behavior and isn’t merely random chance from too small of a sample size (more on that in a bit). Customers do not know they are being split — If they knew they were part of a test, it would influence their behavior (much like focus groups, surveys, etc.). They are simply going through their daily lives and making purchase decisions. In fact, you’ve probably been in a sample for many A/B split tests in your life without knowing it. Customers are randomly split — It’s important that the different groups exposed to the different marketing elements in your test are similar groups. You wouldn’t want to, for example, send all traffic from email to one headline you’re testing while sending all traffic from social media to a different headline. In that case, the difference in results you experience may be the result of the different type of customer seeing each one, not because one headline performs better than the other with all customers. If customers are not randomly split, this represents a validity threat (i.e., a threat to the accuracy of your test results). This particular threat is known as a selection effect. This random split is another reason why A/B split tests are more accurate than surveys or focus groups or similar types of marketing research. These types of research are inherently vulnerable to selection effect. In these cases, you are getting information from customers who self-select to take a survey, participate in a focus group or engage in other types of research and therefore may be more motivated — and otherwise different — from your customers. Since customers do not know they are being split — they are simply going about their regular purchase routine and other behavior — A/B split tests happen with customers who are identical to your customer base because they are, after all, your actual customer base. There are enough customers in the sample — For example, if you only tested with two customers, those two customers are much less likely to represent all your customers then if you tested on one million. Those two customers might just happen to dislike the color blue, and you have a blue car pictured on your landing page, so they bounce. However, that minor detail might not matter to most of your customers. If you take what you learned from only two customers as accurately reflecting all your customers, you would be severely misled. If you tested on a million customers, there is much less likelihood of a random factor like this leading you astray. That is an extreme example of course, but it’s important to understand testing sample size and how many interactions you need for a statistically significant result. After your customers are split, half will be shown Version A (usually the “control,” i.e., what you were doing before) and half will be shown Version B (usually the “treatment” or the new change you’re trying to test). However, you could test more than simply one control and one treatment. You could test one control and two treatments. You could simply test four treatments. Just make sure you have enough traffic or other behaviors so that the sample size is statistically significant, as mentioned above. Think about it this way. If you only have a control and a treatment, and you split 2,000 visitors per day in half, then 1,000 visitors would see each version. However, if you have 10 treatments, now only 200 visitors per day see each version. Before the rise of the internet, recording these behaviors was quite a long project. For example, you might have to write, print, send and then wait for responses to two sales letters you were testing. 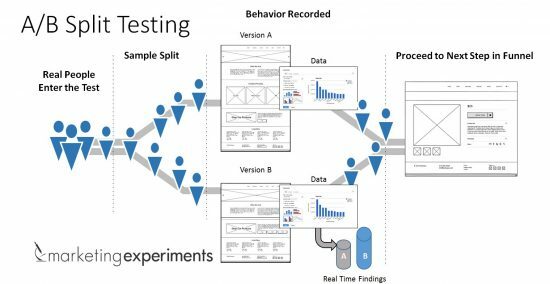 With digital A/B split testing, you’re able to garner real-time findings from your data. This allows you to quickly gain a new customer understanding and use that understanding to better serve customers and improve results. Just make sure you run the test long enough to accurately represent customer behavior. It is much more complex to test multiple steps in the funnel at the same time, and this can raise validity threats. So look at your analytics, and determine where in your funnel it would be most impactful to test (e.g., a landing page). And then send those conversions back into your regular funnel. For example, a shopping cart after the landing page.